Humor Took A Sarcastic Turn In The Late 60's. Shows Like "LAUGH-IN," "SMOTHERS BROTHERS COMEDY HOUR" And "GET SMART," Pointed Out The Seemingly Ridiculous Nature Of Government Actions, And Political Events Happening At That Time. 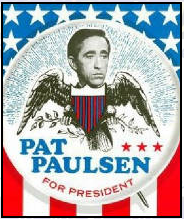 PAT PAULSEN Had A Featured Part On The "Hippest" Television Show Of That Time. The Smothers Brothers Poked Constant Sarcastic Jabs At Corporate America, The Government At That Time And The Vietnam War. PAT Appeared In A Preacher Suit, Neatly Dressed, Complete With Shirt And Tie, And Made "Campaign Speeches" As Though He Was Running For President. Pat Looked Like The Typical Corporate Executive, Never Cracked A Smile, And Stood Perfectly Still. The 60's Generation Knew Exactly What He Was Really About. He Was An Instant Hit, And A Favorite Part Of The Show. He Toured The College Circuit For Many Years After The Show Was Cancelled - High As A Kite.